Inua Ellams is a poet, author, a playwright, a performer, an educator and a graphic (or grafik) artist and designer – he does it all. Contact’s relationship with Inua began in 2009, when we presented his first solo spoken-word show The 14th Tale as part of a UK tour. He recalls falling asleep at the post-show party, overcome by mid-tour exhaustion. Writing The 14th Tale wasn’t something that came easily. By then, Inua was a practiced writer, but as he said “[that] means squat if the story itself is wack!”. “I’m from a long line of trouble makers. Of ash-skinned Africans, born with clenched fists and a natural thirst for battle”. “I was this Muslim, Christian, Libra, Scorpio, Irish, English, Nigerian skinny black immigrant ball of angst and surprise, surprise: I started writing poetry”. Since presenting The 14th Tale, Inua has become a regular collaborator with Contact. 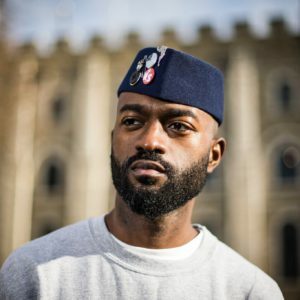 We have presented The Midnight Run, The Black T-shirt Collection and in 2015 commissioned and premiered the The Spalding Suite (with the Southbank Centre) and in 2016 he held a residency with young poets. Encouraged by his mentor to write poetry about himself, his work remains very personal. Last year he toured An Evening with an Immigrant, which tells his story from Nigeria, to Dublin and London through poignant stories, poetry and anecdotes. On the Contact stage in 2009 when he presented his first deeply personal work, he was 24. Now, 10 years later, Inua’s Barber Shop Chronicles presents so many different versions of manhood; from the naïve youth full of anger and frustration to the seasoned barber protecting the young from old secrets. Barber Shop Chronicles opens conversation about what it means to be a man today, conversations overheard in barber shops of London and Africa. From the 24-year-old and self-diagnosed troublemaker, I wonder which of his characters Inua identifies with now? Perhaps there’s a little of him in all of them.